Just before the Labor Day weekend, I blogged here about an Americans with Disabilities Act complaint filed in federal court by the U.S. Equal Employment Opportunity Commission that should have employers scrutinizing their leave policies and procedures. Today, I’ve got news of another EEOC lawsuit filed in my backyard in the Eastern District of Pennsylvania. As I explain below, this one will have you reaching for a different leave policy — parental leave — to ensure no that there’s no hatin’ on the fellas. 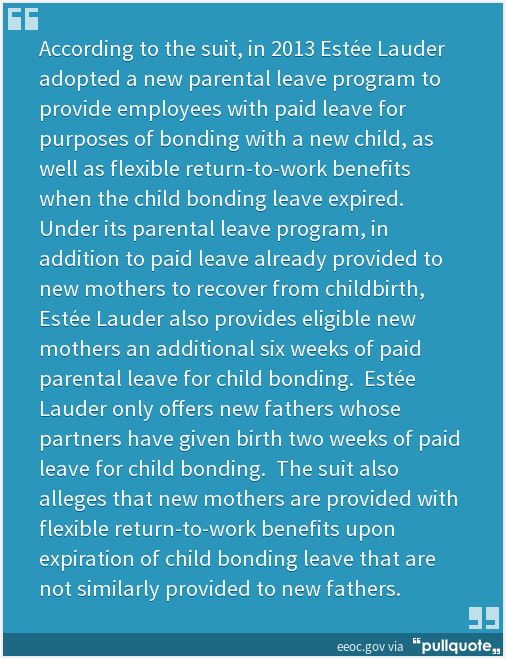 Discriminatory parental-leave and return-to-work benefits policies? The male employee, on whose behalf the EEOC is bringing the lawsuit, allegedly requested and was denied, the six weeks of child-bonding leave that biological mothers automatically receive, and was allowed only two weeks of leave to bond with his newborn child. This is not unchartered territory for the EEOC. Just a few months earlier, the EEOC teamed up with the ACLU, among others, to bring a similar lawsuit against JP Morgan. And, a few years before that, the EEOC settled similar claims against CNN and Turner Broadcasting. But, don’t say I didn’t warn you about this! Have a sip, at least.